I’m not sure where to begin with Jeffrey Eugenides’ Middlesex, simply because there is so much to it: spanning across the story of three generations in a family, the story takes place over many years, as the protagonist, Cal, recounts how he came to be, and how his life shaped who he is now through a long history of family and discovery. We begin in 1922 in Greece, where Cal’s grandparents first begin their relationship under intense shame due to the fact that they are siblings. When their town is attacked by Turkey, they choose to flee to America and begin a new life there, chasing the American dream but also to leave the secrets of their relationship behind them. From here we follow Cal’s grandparents as they begin their American lives and have children, who then go on to have Cal and his brother. However, throughout Cal’s tale we are well aware from the beginning that Cal is intersex, yet this was unknown to his family and birth, therefore causing him to be raised as a female, Calliope. The latter parts of the novel culminate in Cal’s understanding of himself and his identity throughout life. 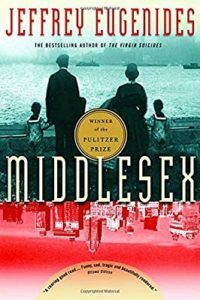 Middlesex is absolutely packed with thematic elements, relationships, and family history. Of course, because there is just so much to it, some sections absolutely flew by and riveted me, while others felt like a bit of a drag. But the writing is ultimately incredibly rich, and filled with the complexities of human life, as well as very complex reactions on my own part. For instance, a major aspect of this novel is the subject of incestuous relationships, which on one hand work in how they illustrate the isolation of certain rural life and how people are therefore drawn to each other, and it also illustrates serves as a marker of genetic understanding of the biology of intersex individuals. But at the same time, it’s still not exactly the easiest subject to get around, and Eugenides teeters along the line of having characters suggest that perhaps their struggles (including those of Cal’s gender) are punishments for their acts and loves, while never fully backing this idea: the writing makes sure we understand all the thoughts and behaviors of the characters present, as this shows how very real and complicated they are, while never fully condoning their decisions or making it seem like they are flawless. There are reasons for everything that everyone does, but are they the right reasons? That’s always the question. In any case, Middlesex was a bit of an undertaking to read, but not a regrettable one. It is intricate and intimate, and while perhaps a bit of it seems extraneous or there are sections that are a bit more of a struggle to get through, overall the execution is good, even if at times I wondered how our protagonist and his first-person recounting knew so much about what was going on in the heads of those in his family throughout their history. But at the end of the day, this knowledge just made these characters more understandable, relatable, and rounded, which worked well in the grand scheme of things. Share the post "I Have Heard of This Book So Many Times Without Ever Actually Knowing What It Contained"